Concrete needs to be waterproof because of its physical characteristic of being porous. If not waterproofed, the porous spaces can become spaces for leaking water. Also, concrete is vulnerable to cracking due to the fluctuating temperatures in the environment. If you want to protect the concrete surfaces for many years, you will need to install a waterproof membrane. There are many concrete materials and products that can be used to safeguard your building. 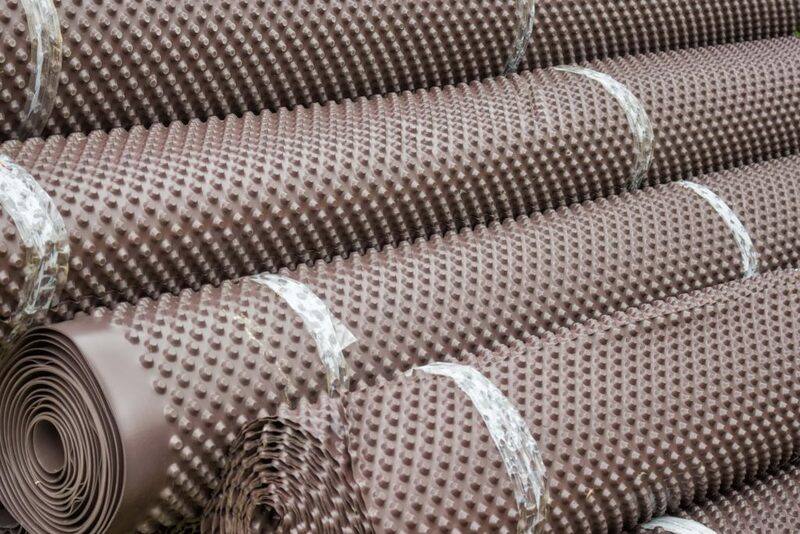 Some of the materials and methods we use at Waterproofing Singapore. Liquid applied membranes are applied either by using a roller, spray, trowel, brush, or a squeegee. The choice of the equipment to be used depends on the surface being applied. For a large surface area like a rooftop, a spray is more applicable. The liquid waterproof can either contain polyurethane or epoxy substances that have good characteristics of a membrane. Liquid membranes can withstand UV rays and are environmentally friendly. Bentonite is a type of clay that has unique characteristics like of sealing, thickening, and cohesion that makes it a suitable waterproofing material. It forms an impermeable membrane once installed don a concrete surface and protects your home from water seepage. Depending on the thickness to be achieved, the contractors decide on what rate to mix the bentonite chemical materials. Bitumen is a black substance that has been used in making waterproof membrane. It is suitable for flat surfaces because it comes in rolls. The sheets are usually placed close to one another to cover a wall or a roof. It involves the use of a torch to melt the bitumen so that it can be firmly attached to the surface. The waterproof paint acts as a case to protect walls and other concrete surfaces from moisture accumulation. Water is a common problem with many buildings because it can cause the formation of molds, discolor the original painting of the house, and can attract dangerous insects. Waterproof paints provide a seal that will protect your walls from these water accumulation side effects. Waterproof paints last longer than normal paints. One of the most cost effective ways of protecting concrete surface is through applying waterproofing sealer and sealants. It preserves and extends the lifespan of the concrete surfaces by protecting them from moisture and water. It also protects the surfaces from chemical spills and UV rays. The rubber material has the strength and is designed for waterproofing buildings in extreme areas. It is an excellent coating for both concrete substances and wooden surfaces. The rubber is environmentally friendly and has no odor. Therefore, it can be installed in an already occupied building. It is highly resistant to aging and UV rays. The cementitious material protects a concrete surface from chemical attacks and water attacks. The coating can be applied through spraying a surface because it is a semifluid substance. This method is highly useful for coating wastewater treatment facilities, concrete tanks, and tunnels. The material to be chosen for your home will be determined by the architectural design. This is because the waterproofing membrane should blend with your exterior design of your home. We consider the much amount of money a customer is willing to spend on the waterproofing materials and methods. We always select materials and a method that a customer can accommodate and that which will be able to serve for many years. Sometimes cheap might be expensive because you may require spending more money on the maintenance services. We choose the materials that have a longer lifespan so that they ca serve you well. A good waterproofing membrane should last up to 25 years before it can be replaced. Durable materials will save your maintenance costs. A good method should be able to withstand extreme weather conditions like heavy rainfall, storms, and extreme sunshine. Some waterproof materials might not be able to withstand heavy rainfall and extreme sunshine rays. As a result, they will wear and tear easily. Also, some methods may require more than one coating to increase their strength. We recommend materials that are energy efficient so as to save on energy charges. Energy efficient materials are environmentally friendly and will save you money you could have spent on large energy bills. A good waterproof material should be elastic because concrete expands and contracts during different climatic conditions. An elastic membrane will be able to cover the concrete surface and protect your house from water leaks. Our technicians will always choose the best material while installing a waterproofing membrane n your building. Sometimes a customer may require a quick membrane fixing. Therefore, we look at different characteristics of various products and choose the one that will take the least time. Some methods may take more than a day because they are critical and need extreme attention. For example spraying a liquid membrane may take a short time to finish the installment and it cures quickly. For uneven surfaces, we recommend flexible materials like liquid membrane because it can reach different parts of the concrete surface, especially the roof. For flat surfaces, we can install the bitumen sheets because they are manufactured in rolls. Different parts of the building require special treatment when it comes to waterproofing materials and methods. Materials that are easy to maintain through cleaning are highly recommendable. The materials used should be resistant to cleaning detergents and other washing chemicals to allow the homeowner to wash and clean the surfaces. Those that are not easy to maintain they can be used for basement and foundation waterproofing. You should no longer worry about what waterproofing materials and methods to use. Reach us today, and we will guide you through selecting the best membrane type for your building. We have solutions for both residential structures and commercial buildings.